IN STOCK: In Our Vaults & Ready for Immediate Shipment. Call us at 1-866-898-4805 or email us at buybacks@silver.com to sell your items. Note that the price listed is not a confirmed bid and buybacks are subject to $1,000 minimums as well as possible maximums depending on inventory positions, and require verbal confirmation via phone. Available as low as $8.99 per coin over spot! The latest Silver Chinese Panda coins are now available on Silver.com, and the Chinese Mint has not disappointed investors or collectors with its all-new design. 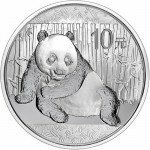 First introduced in 1983 as a proof coin, the Silver Chinese Panda is the official silver bullion product of the People’s Republic of China. Today, Silver.com has the 2016 30 Gram Silver Chinese Panda Coin available for investors and collectors to purchase. Packaged in sealed sheets of 15 coins, and shipped inside boxes containing 30 sheets of 450 coins in total. Individual coins ship in individual mint capsules. Consists of 30 grams (.9645 troy ounces) of .999 fine silver. Issued a face value ¥10 (Yuan) by the Chinese government. Features the all-new 2016 Panda design. Mintage capped at a maximum of 8 million coins. 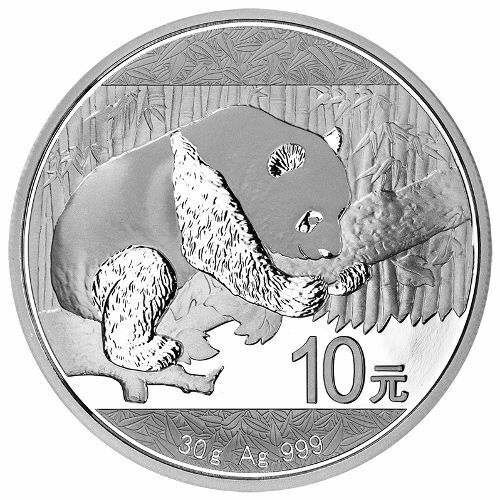 Silver Chinese Panda coins celebrate perhaps one of the most recognizable wildlife species from the nation of China. Found predominantly in the highlands of central and western China, the panda is an unofficial symbol of the nation, and as easily associated with Chinese culture as the dragon. The Chinese Mint originally introduced Silver Chinese Panda coins in proof from 1983 to 1985. After sporadic production the next few years, the bullion and proof versions of the coin entered regular production in 1988. 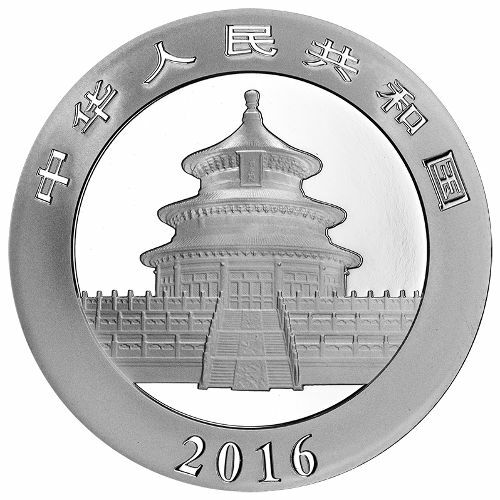 That makes these 2016 30 Gram Silver Chinese Pandas the 18th consecutive production of program. On the reverse side is the image of a panda as it crawls along a fallen tree trunk. A wall of bamboo shoots is visible in the background, while engravings on this face include the coin’s face value in Yuan, its’ weight, metal content (Ag), and purity. The obverse features the historic Temple of Heaven. Constructed more than a millennia ago, the Temple was once a house of worship for dynastic leaders in China and the site of sacrifices. Today it holds a special place in Chinese culture. The Chinese Mint is controlled by the government of the People’s Republic of China and the People’s Bank of China. Bullion and proof coins produced by the Chinese Mint are hard to identify by location because no mint marks are used to identify individual mints. Please feel free to reach out to Silver.com with your questions. You can contact one of our associates at 888-989-7223, online using our live web chat, or via email.